Cities of the bigger format are unusual in the home country of this band, Norway isn’t exactly brimming with big cities but these guys still figured it was a good name. I guess they didn’t imagine that writers like myself would like to google the name and the record title to find out more, I didn’t find anything about the band when doing so. But the press sheet had some information, like the fact that we get two albums in one here. The new album Big City Life is on one disk and then we get another disk with their debut album Wintersleep that was released digitally back in 2013, and you get both those records behind a pretty nice cover artwork. 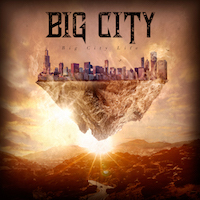 This review will focus mainly on the new album Big City Life as that one is the new release here. Wintersleep is quite similar to Big City Life when it comes to musical style and quality. I think that melodic heavy rock as the press sheep describes it, is a good way to describe this album, as it is something in that style. There are ten tracks on Big City Life and they could have showed a bit more variation as my impression is that the album lacks a bit of variety and the songs are all rather similar. There isn’t very much depth I would say and they aren’t exactly offering us something we haven’t heard before, there are no surprises on offer on this album. But the vocals are pretty good, as is the production, much like most of the good albums in this genre; they are usually well made albums, just like this one. To call it a good album is not wrong, I have enjoyed listening to it as the songs are good and it is pretty catchy and so on. I think that there is quite a big risk that this album will drown in the ever-growing mainstream of melodic rock/hardrock albums; it doesn’t have what it takes to really stand out. I think that one might call it a good, but not a memorable album. The Norwegians needs to make something a lot more exciting if they want to be noticed, and as a band I guess you need to be noticed if you want to accomplish anything. You should look closer at this album if you really enjoy everything in the melodic heavy rock genre; chances are good that you find it an enjoyable album. I think it has been a good album to listen to with good songs and all of that, but I don’t think it is a very memorable album as it lacks stand out tracks. So while it isn’t an album that will disappoint, but neither will it have you jump from the greatness it displays. Perhaps it is music for the big city life.